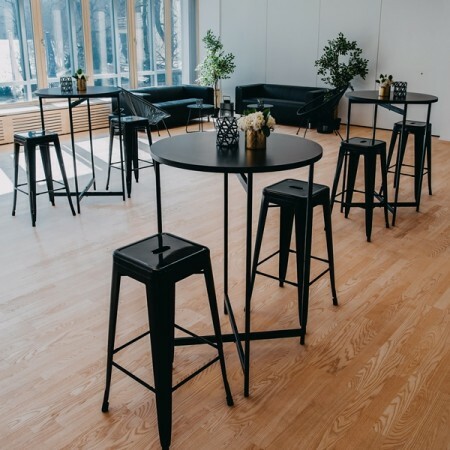 Bar tables Flow are a great connecting element for gathering guests for a chat, snack or beverage. Create perfect yet raw atmosphere anywhere. 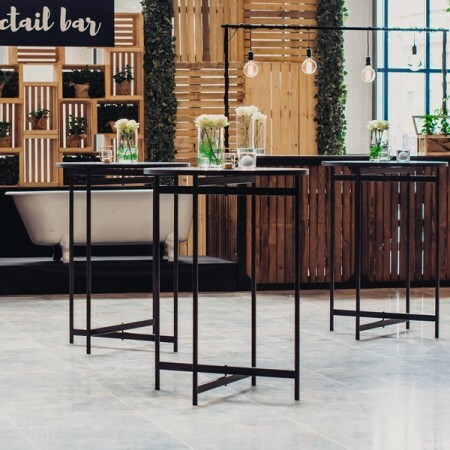 Bar tables Flow for hire look fantastic in any reception area. They are sleek and stylish, hugely versatile and good for space saving, sitting beautifully in the corner of your reception space. Its raw appearance is perfect for elegant but also for really popular industrial styled events. 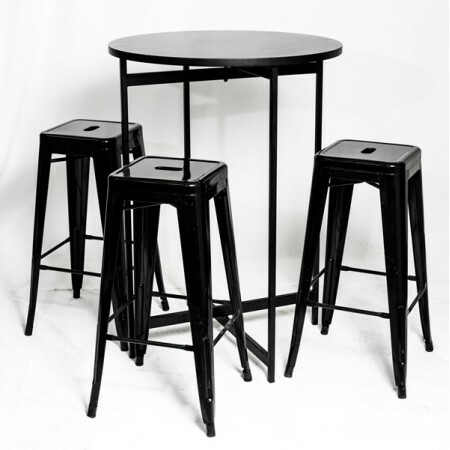 These tables are great for outdoor seating or for use along side our selection of industrial looking Tolix bar chairs. Is the catering for your event all set up, but you still need a table where you will place it all? 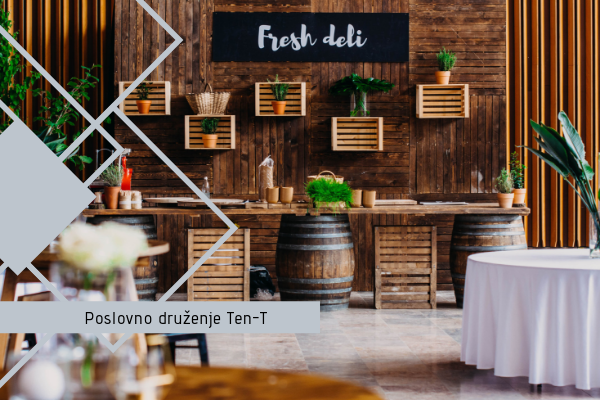 At Hiša vizij you can find various table rentals, which will provide a perfect place for your guests to gather around, chat and eat great food. We offer you a wide range of event table rentals, made for every occasion – a wedding, business conference, evening party or a workshop. The various types of event table rentals give you an option to choose among those that will help you organize your event according to the theme that is to your taste and preference. Event table rental is also very popular for weddings, not just business events. The most magical day of your life can take place at any location and style that you choose. All you have to do is choose between an indoor space or a picnic place and we will take care of the event tables. 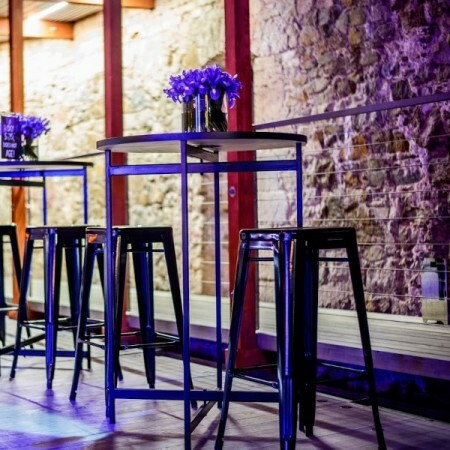 Event bar tables can be substituted for classical dining tables, which are perfect for sit-down events or events with catering services. You can also combine those two types of event tables and that way satisfy every guest. For special themes, you can also rent special event tables, such as a table made from wooden tiles or a table standing on two barrels. Natural materials will always bring a sense of freshness and add a natural feel to your event theme. 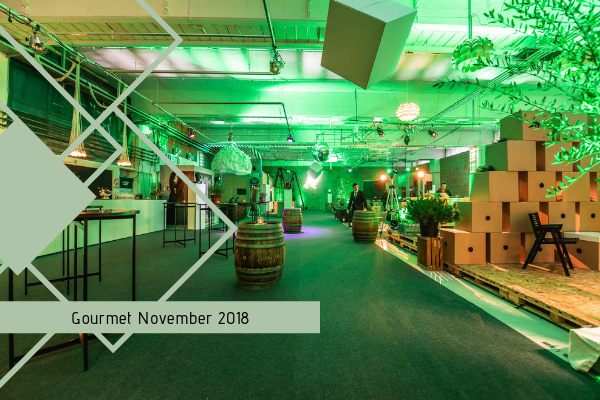 A large number of event tables is crucial for night parties because those types of social events include a lot of talking and networking between the guests. 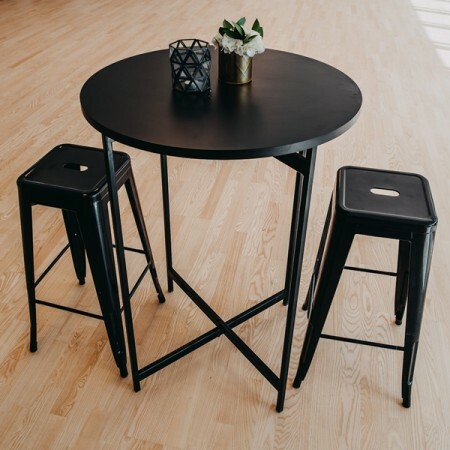 Standing tables are therefore the right type of event table because it is easier for guests to circle around and chat with the other invitees. Evening events can also be decorated with lighting elements, which can be used for sitting down or as a table. Different shapes and sizes can turn an ordinary event location into a very dynamic one and the guests will undoubtedly be amazed by the various colours. If you prefer classical coffee event tables, which are lower than regular ones, then you can rent those as well – together with the sofas, they will make a perfect combination. Event table rental is also very popular for other occasions. You can rent them for commercial recordings, fairs or other business events. We will also take care of the setup and transport of all furniture, which will save you a lot of time and effort. Our specialists in event management will always be there for you and will help you make the right choice and make sure your event organization is much simpler.